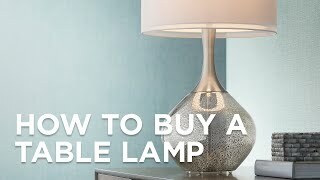 This Color + Plus™ hand-crafted table lamp sparkles with a lovely Gunmetal Gray Metallic designer color base. 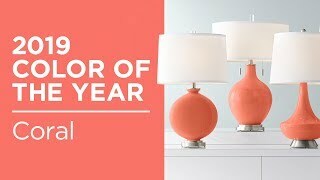 Define your decor with the designer style of this Color + Plus™ glass table lamp. The design is hand-crafted by experienced artisans in our California workshops with a stylish Gunmetal Gray Metallic designer color with small metal flakes. This high-quality look sparkles luxuriously - like a new car in the sunlight! 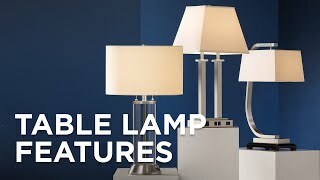 The lamp stands on an antique brass finish metal base, and is topped with a chic cream softback drum shade. Lamp base U.S. Patent # 8,899,798. 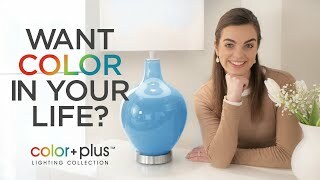 This Color + Plus&#8482; hand-crafted table lamp features a lovely Deep Lichen Green designer color base. 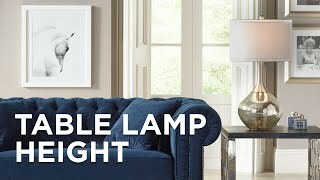 This Color + Plus&#8482; hand-crafted table lamp features a lovely Silver Lining Metallic designer color base and designer navy blue satin drum shade.